While it doesn't seem like it would be, getting ribs right is tough! It's really a mostly a matter of texture (and some personal preference), but there's a fine line between ribs that are “done" but under-cooked and tough, ribs that are over-cooked and almost mushy, and that perfect batch of ribs that's tender, yet provides that ideal texture that compliments your favorite BBQ sauce. While our Whole Hog™ (or Uncontrolled Whole Hog™) blend doesn't make it any easier to determine when it's time to take the ribs off the heat, it sure does take all the guesswork out of seasoning and flavor profiles. Just the right amount of heat balanced with a little sugar and some sweet/hot ginger makes these blends the obvious choice for pork. Our hot (no pun intended, though our target finished temperature is 200℉) tip on ribs is to get an excellent instant-read meat thermometer to help you gauge when it's time to pull them from the heat and when checking the temperature, keep the probe well away from all the bones! Spice Confidently! ...test for doneness by picking the rack of ribs up with tongs from the middle. Both ends should remain on the cooking surface, but the middle should /give/ enough to let you lift it 4-6” without falling apart. 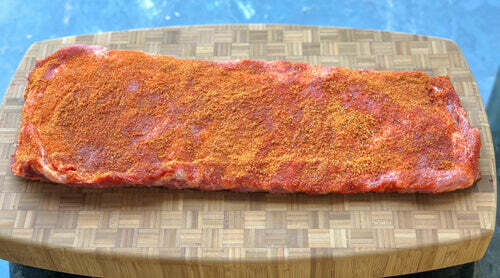 Trim the ribs as needed and remove the membrane from the bottom of the rack of ribs using a dry paper towel. Sprinkle the ribs with salt at about 1/4 teaspoon of table salt per pound of ribs. Sprinkle Casa M Spice Co™ Whole Hog™ or Uncontrolled Whole Hog™ rub at about 2-3 tablespoons per side for each slab of ribs. Rub the ribs gently to get the seasonings evenly dispersed. Cover with food film and refrigerate for at least 2 hours up to overnight to dry brine the ribs. Load (we like a mix of hickory, mesquite, and apple) and heat your smoker to 225°F. Move the ribs into the smoker and cook. Monitor the ribs closely starting at about 5 hours to test for doneness. 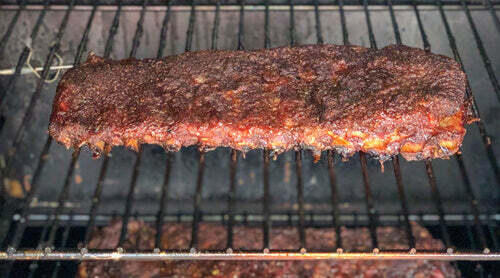 This is the hardest part of this recipe — the ribs will be safe to eat, albeit very tough, below a temp of 180°F, but the connective tissues start to break down at around 190-200°F and our target is to hit that range and start to test for doneness by picking the rack of ribs up with tongs from the middle. Both ends should remain on the cooking surface, but the middle should /give/ enough to let you lift it 4-6” without falling apart. 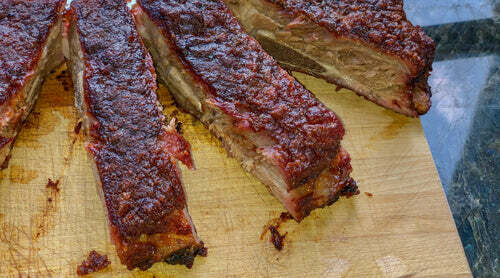 Remove the ribs from the smoke and let them rest for 10 minutes, then cut and serve!